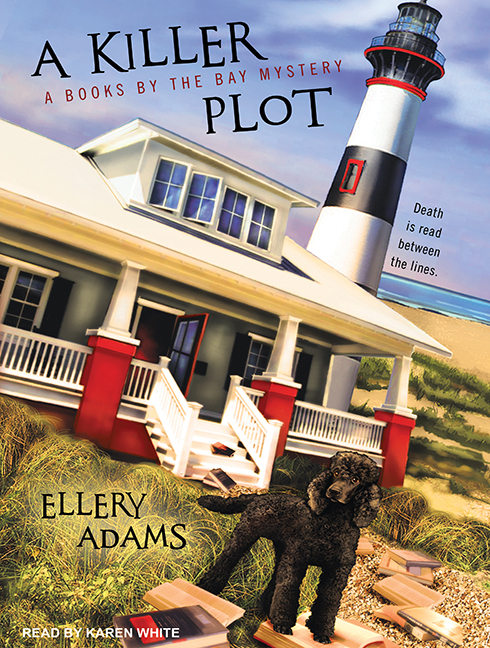 I visited Palmetto Island (aka Bald Head Island) prior to writing this book, and I saw the Quarantine Pad out in the water and it immediately caught my interest. In researching the shipwrecks around the island and the mouth of the Cape Fear River, I ran across the history of the platform and wanted to include it in the book. I love adding bits of North Carolina history to this story. First of all, I love the state. Secondly, I believe readers enjoy the history as much as I do. As for sharks? I think I’ll leave those to Peter Benchley. 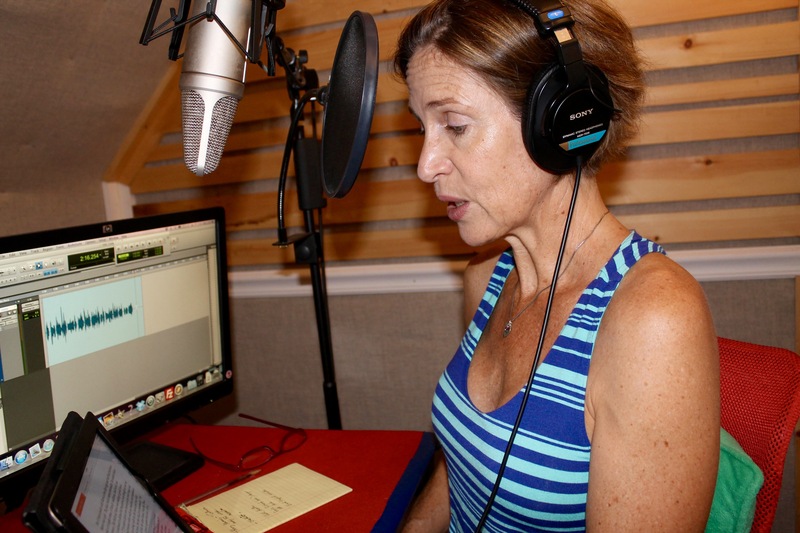 Karen White in the narration booth. Olivia loves her metal detector. Do you share her love of hunting for beach treasures? I poached this habit from my older brother, actually. He is the avid metal detector hunter and, like Olivia, keeps his finds in jumbo pickle jars labeled with the month and year. The real Bald Head Island has an annual Golf Cart Parade like the one the characters compete in on Palmetto. Have you participated in a Golf Cart Parade (or a Cardboard Regatta like the ones we’ve seen in previous books)? I grew up on the water (a harbor off The Long Island Sound) and there were many water-related festivities. Though we didn’t have Cardboard Regattas, people decorated their boats for Christmas and we could watch a parade of lit vessels from the back deck of our house. Our local yacht club was two doors down, so I spent my summers there and one of my favorite memories was decorating my bike for the Fourth of July Parade. Many of my coastal memories have morphed into these fictional scenes. Laurel tells a story about being so sleep deprived after having the twins that she puts a dirty diaper in the produce drawer of the fridge. That sounds like one of those things that had to happen in real life – did it happen to you or someone you know? I don’t think there’s a parent out there who doesn’t recall the challenging first weeks of parenthood. My husband is a physician, so he was often on call (in the hospital—not at home) when my kids (aka trolls) were newborns. I struggled with sleep deprivation during those first few months. I could barely write and my mind was very foggy. I was also far more emotional than I could ever recall being. So Laurel’s experience was definitely personal, but I bet there are thousands of readers who can identify with pouring coffee into the baby bottle or standing in the middle of the grocery store with absolutely no clue what they’d gone in to buy. Do the Bayside Book Writers each carry a piece of you in them? They are all so different, but I can see them as representing the different parts of one psyche. Their writing certainly does! This stems from my love of reading across genres. I just love books. I love books and stories. I used to write poetry in my twenties and became a fan of many contemporary American poets during that decade. By writing Books By the Bay, I get to be a fan of all things book-related and it’s probably why readers are so attracted to the series as well. Very few readers only love one genre. Most of us just yearn for a good yarn and don’t limit ourselves to a particular corner of the bookstore. I was struck by Olivia’s statement to Rawlings (p. 152): “Some people attract darkness.” Do you think that’s true? Yes. I do believe that some people are better equipped to face and repel darkness and they also have the eyes to recognize it. Are you an audiobook listener? If so, what makes you choose to listen rather than read in print? I am an avid audiobook listener and have been for years! I drive my trolls to school every day and it’s an hour in the morning and an hour in the afternoon. That’s my book listening time. I prefer books on CD, so that’s what I buy. And the narrator is very, very important to the story. If the narrator is talented, I will choose to listen to the next installment instead of reading it in print. Two of your series are being produced in the audiobook format this year by Tantor Audio. Has the process or product been different than you imagined? Have Johanna Parker and I worked with you in different ways? You have definitely challenged my knowledge of Native American pronunciations – LOL! The Book Retreat mysteries, which are narrated by Johanna Parker, are chock full of literary references, but less historical references. Therefore, you have the harder task when it comes to getting names right and it’s been really fun for me to learn that how I often heard these names in my head was incorrect. For example, I always thought that Stede Bonnet’s surname was pronounced like a French name. In truth, it’s pronounced like a ladies’ hat. 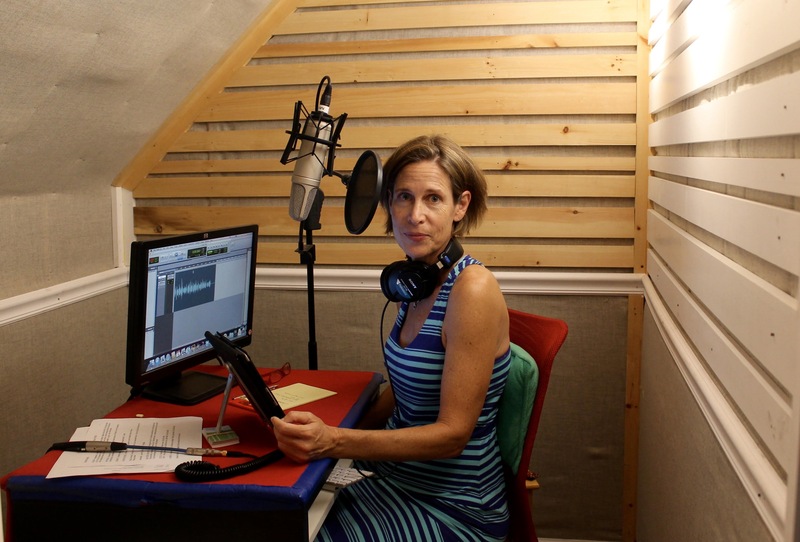 I love to learn things, especially when they are related to North Carolina history, so it’s been exciting for me to gain new insights through the audiobook process. I’ve enjoyed working on a few cozy mystery series over the past few years. Creating a town full of quirky character voices that return again and again and creating a strong, if prickly, main female character’s voice are things I love (and I appreciate the lack of gore, which tends to give me nightmares). What do you love about writing in this genre? Simply this: At the end, there is justice and redemption. Not necessarily a happy ending because my characters (especially the villains) are complicated and though there’s a resolution, it doesn’t always lead to happiness. In fact, I always try to eek some sympathy for the criminal because no person is all good or all bad in the same way that I try to show that Olivia, though she’s the heroine, is obviously flawed. With a household made of a husband, two school-age kids, and three cats, I’m never by myself for long, but I do often feel disconnected from my fellow writers because we mainly communicate via e-mail and Facebook. I prefer face-to-face interaction and because my schedule is so full and I have responsibilities as a mom, I can rarely attend conferences or events where I might mingle with my writer friends. I do miss seeing them and the readers I’ve become close with over the years. I do find Facebook valuable in the sense that I’ve made friends through that platform who are only a message or post away. In general, the people I know on Facebook are sweet and supportive. That might be because most of my friends are mystery readers and writers and we’re pretty nice people in general, even if we enjoy reading about murder all the time. 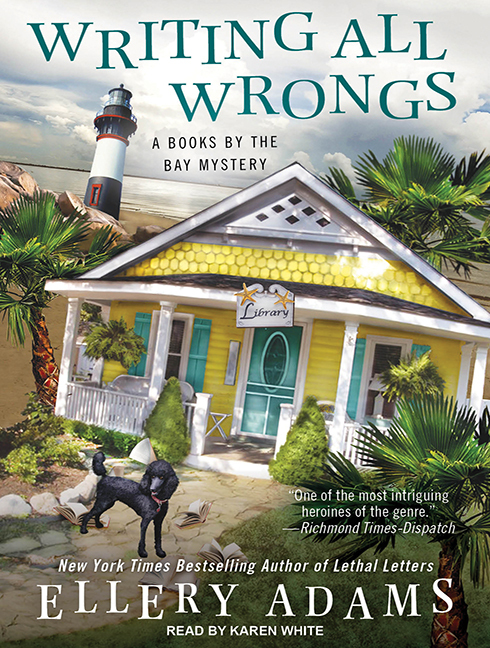 Writing All Wrongs book 7 in the Books by the Bay Mystery series available on audio December 15, 2015. 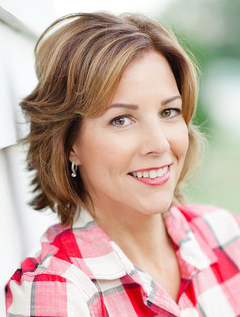 Next week Ellery Adams’s fans interview Karen White!